The modern Montjuïc cable car enables visitors to travel up the east side of the mountain, stopping at the most important points on the route, such as the castle at the top. 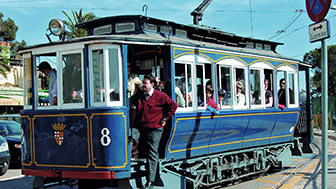 As well as making it easier to climb, the journey itself offers visitors the chance to admire the wonderful panoramic views of Barcelona and to enjoy a unique experience in natural surroundings. Renovated in 2007, the Montjuïc cable car is much more than a means of transport because, thanks to the privileged views it offers, it has become one of the mountain's big attractions. It is very easy to access, as it stops at three different points along its route. 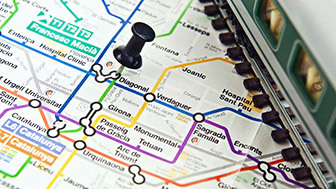 The first stop, Parc de Montjuïc, is situated on Avinguda Miramar, very close to the funicular railway station that climbs up the mountainside from Paral·lel. From this point you can access some of the most important cultural attractions in the park, such as the Joan Miró Foundation, Poble Espanyol and the Museu Nacional d’Art de Catalunya (MNAC). Making the journey by cable car gives visitors the opportunity to stop at each station to enjoy everything on offer there. The second stop, Mirador, enables visitors to reach the famous Mirador de l’Alcalde vantage point, a landscaped terrace with exceptional views over the Port of Barcelona. Close by is the emblematic Monument a la Sardana, and the entrance to the Jardins de Joan Brossa. 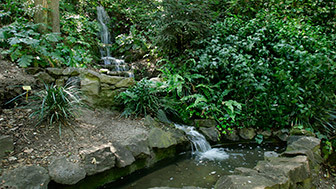 These woodland gardens are a great place to venture into with a childlike spirit, as they are home to musical cushions, zip lines and climbing games. The third and final stop is Castell de Montjuïc, where you can visit this 17th century military fortress and carry on enjoying the spectacular views over a large part of the city from the mountain top. From the modern cable car cabins, which hold up to 8 people, you can observe the city in motion without losing sight of important buildings such as the Sagrada Família or the Agbar Tower. The experience of gradually zooming out from the city as the cable car climbs the mountain, and the opportunity it provides to get a bird's eye view of Barcelona is a unique experience that is well worth trying. Unique forms of transport allow you to discover the city from highly original perspectives. Parc de Montjuïc is the best place for enjoying nature and culture at the same time.